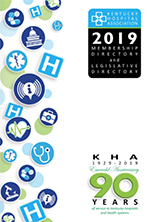 One of KHA’s most important priorities is advocating on behalf of all Kentucky hospitals with state and federal legislators, government agencies and leaders. It is important that hospitals are fully represented to those who create laws and regulations which directly impact hospitals’ ability to provide access to quality health care. Page for hot bills, talking points & resources.